The five points of Calvinism as they are known today were not laid out this way by Calvin himself. The five points are the result of the Synod of Dort (1618–1619) long after his death that was convened to address a growing movement among the Reformed Churches called Arminianism. Arminianism is the teachings espoused by a professor named Jacobus Arminius (1559-1609) and his followers the Remonstrants. The five points of Arminianism are Deprivation, Conditional Election, Unlimited Atonement, Resistible Grace and Assurance and Security. The five points of Calvinism are the result of the articles agreed upon at the Synod of Dort that addressed and condemned as heresy the five points of Arminianism. The five points of Calvinism are often referenced with the acrostic TULIP. To ensure a proper understanding of what each doctrine means I will provide a definition for each. The acronym and the terms used for each letter sometimes create some confusion so the definitions below should ensure there is clarity to what each term actually means. Total Depravity – This doctrine does not mean that man is as wicked as he could possibly be it means that sin has affected every aspect of his being (mind, body and spirit). It also means that man is completely unable to please God and he can do nothing meritorious to God. It means that man is dead spiritually and unable to bring himself to life, he is a slave to sin and unable to free himself. Unconditional Election – This doctrine teaches that God before the creation of the world elected some individuals to eternal life and salvation. This election and choosing was not based upon anything within the man but is determined by the kind intention of God’s will and is purposed to to bring praise to His glorious grace. Limited Atonement – This doctrine teaches that the atonement of Christ on the cross was intended for and applied to the elect of God. It means that Christ completely saved certain individuals at the cross. The atonement was particular in its intention and effect but sufficient for all. This doctrine does not teach that Christ’s sacrifice was incapable of saving all people but that it was not intended for all people. Irresistible Grace – This doctrine says that when the Holy Spirit regenerates the heart of the individual that God has foreknown and elected to salvation that individual will without fail come to Christ in faith. The person that God is saving cannot successfully resist the Grace of God and prevent God from saving him. The regenerated person will always believe and trust in Christ alone for his salvation because he has been given a new heart with new desires. The regenerated person has been given a new spiritual nature that both desires to and can please God. Perseverance of the Saints – This doctrine teaches that God will persevere all of his elect to the end. It teaches that the elect of God will continue in the faith till the end of their life because their faith is a gift from God and Christ is mediating and interceding for them. The Doctrines of Grace (Calvinism) are often accused of being the result of man made logic and not Biblical testimony. This however is simply false, most who make this accusation are usually just ignorant of the Biblical basis and foundation. There are others who reject the Doctrines of Grace but are aware of the passages of Scripture that clearly and systematically lay out the sovereignty of God in salvation. They will admit that the Bible does seem to teach these doctrines but will at the same time also affirm that the Bible teaches man’s free will in salvation. To them the Bible teaches both so they just pick the free will side because they know they have free will. The problem is they are affirming that the Bible actually teaches two antithetical and contradictory points of view on salvation and they are assuming the validity of their definition of free will without submitting it to the testimony of Scripture. Upon close examination most of the Scriptures that are used to appose God’s sovereignty in salvation are being interpreted with the assumption of free will and are either committing the logical fallacies of begging the question or affirming the consequent. We always need to define our terms in a discussion and if the assumed “free will” which is being used to interpret Scripture means that we are not slaves to sin, not dead spiritually and able to do that which pleases God then we are assuming a position about the will of man that the Bible rejects. If free will means that we equally have the ability to do that which is good and evil then we are once again assuming a definition of free will that even God himself does not have and is not Biblical. If our definition of free will is that we make free choices that are consistent with our nature now we have a definition that works Biblically and is consistent with God’s free will. There are about seven verses that most Arminians will use to try to disprove the overwhelming Biblical teaching on God’s sovereignty in salvation. We will address these in an upcoming article. This article’s purpose is to show the Scripture that demonstrates God’s sovereignty in salvation. There are several Scriptural passages that systematically lay out God’s sovereign grace in salvation, these are John 6:22-71, Romans 8:28-9:29, and Ephesians 1:3-14. For any serious person who is searching out these truths these would be the passages to start with. We will close out this article with Charles Spurgeon (see end of article). The Scriptures below are laid out to demonstrate the clear Biblical testimony of the Doctrines of Grace (Calvinism). 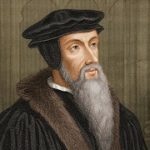 Once the Scripture has been examined, read and believed it cannot be said that these doctrines were contrived in Geneva, Switzerland from the mind of John Calvin. These doctrines come for the overwhelming testimony of Scripture Alone. There is no attribute of God more comforting to his children than the doctrine of Divine Sovereignty. Under the most adverse circumstances, in the most severe troubles, they believe that Sovereignty hath ordained their afflictions, that Sovereignty overrules them, and that Sovereignty will sanctify them all. There is nothing for which the children of God ought more earnestly to contend than the dominion of their Master over all creation—the kingship of God over all the works of his own hands—the throne of God, and his right to sit upon that throne. On the other hand, there is no doctrine more hated by worldlings, no truth of which they have made such a foot-ball, as the great, stupendous, but yet most certain doctrine of the Sovereignty of the infinite Jehovah. Men will allow God to be everywhere except on his throne. They will allow him to be in his workshop to fashion worlds and to make stars. They will allow him to be in his almonry to dispense his alms and bestow his bounties. They will allow him to sustain the earth and bear up the pillars thereof, or light the lamps of heaven, or rule the waves of the ever-moving ocean; but when God ascends his throne, his creatures then gnash their teeth; and when we proclaim an enthroned God, and his right to do as hewills with his own, to dispose of his creatures as he thinks well, without consulting them in the matter, then it is that we are hissed and execrated, and then it is that men turn a deaf ear to us, for God on his throne is not the God they love. They lovehim anywhere better than they do when he sits with his sceptre in his hand and his crown upon his head. But it is God upon the throne that we love to preach. It is God upon his throne whom we trust. It is God upon his throne of whom we have been singing this morning; and it is God upon his throne of whom we shall speak in this discourse. I shall dwell only, however, upon one portion of God’s Sovereignty, and that is God’s Sovereignty in the distribution of his gifts. In this respect I believe he has a right to do as he wills with his own, and that he exercises that right. No, Calvinistic doctrines weren’t “contrived”; they are sincere interpretations of Scripture. It’s just that they’re sincerely wrong. I refer you or your readers to http://arminians.org/. Would you be willing to come on the podcast and defend your assertion that Calvinism is sincerely wrong?